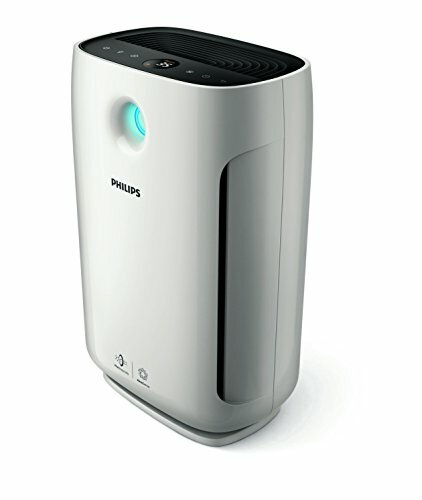 Philips has been a stalwart in the air purifier sector in India for several years. Until recently, they were one of the only real choices that consumers have had. Today the air purifier landscape in India has changed and now there are many multi-national brands selling their products along with locally made brands. A few years back, the models like the AC4372 and the AC4072 were the only real options for people of India, but the price was prohibitive for most. The increased competition means that Philips needs to improve on its models and the Philips 3000 Series AeraSense AC4326 looks to do just that. The video below shows an unboxing of the AC3256 so you can review the size and performance of the unit as well as understand what you’ll get when you purchase it. This educational video from Philips explains in detail how an air purifier works to remove the invisible pollution and harmful PM2.5 particles from your home. With the exception of the entry level AC1215, Philips creates some of the best looking air purifiers. By their very nature, air purifiers have to be fairly large and without a good design aesthetic, there’s a danger that they might dominate the room. In the case of the AC3256, it brings Philips good design sense so that it doesn’t look out of place in a home, nor dominate the room. If you are only planning on buying one air purifier for the home, you will probably want to move it from room to room. The AC3256 comes with a handle built into the body form itself to allow you to easily pick and carry it around your home. This is one of the first times we’re seeing such a feature built into the body of an air purifier and is an indication of just how seriously the Philips product design team take form and functionality. A characteristic that many higher end Philips air purifiers have in common is the Air Quality Indicator LED ring. This unique feature glows red, blue and violet depending on the air quality in the home. It’s a small touch but it gives you a quick visual to give you peace of mind. The control panel, like all modern air purifiers, sits on the top of the unit. From here you can control all the operations of the unit. From right to left, in the image above, you have the power button, the child lock, the LED light dimmer (good for when you want to sleep! ), the real-time PM2.5 particle concentration display, the fan speed, the sleep timer and the reset button. A very useful feature is the automatic resumption of operation after a power cut. As long as the unit is still plugged in after a power cut, it will resume working with the same settings. The Philips AC3256 is no slouch when it comes to performance. With a 1000 square foot coverage and a clean air delivery rate (CADR) of 367 m2/hr, you are getting a lot of bang for your buck. It has one of the best performances in terms of raw power in its price range. The performance is mostly thanks to the five levels of fan speed available to you. At full power, the unit is drawing 60 watts and generates 68 decibels of noise, which is quite loud. However, by repeatedly pressing the fan button on the control panel, you can select the ‘auto’ mode, which Philips calls its ‘AeraSense’ technology. AeraSense is basically an autopilot for your air purifier. Since the AC3256 is able to monitor the actual level of PM2.5 particles and other pollutants in the air, when the levels are very low, it can automatically turn down to the lowest power setting. The moment it senses a higher concentration of pollutants, it can increase the airflow to quickly bring down the levels again. The video below gives a visual explanation of how it works. At the lowest fan speed, the unit is quite literally quieter than a whisper which is perfect for the bedroom. Drawing just 11 watts of power, the fan generates 32 decibels of noise. To give you some context, that’s about as quiet as a library. Most air purifiers work well on particles called PM2.5. These particles are so small that they can actually enter your bloodstream via your lungs. With the Philips VitaShield IPS technology, you can filter particles as small as 20 nanometers in diameter – upto 100 times smaller than PM2.5 particles. This means it can filter out additional things like bacteria, allergens and even some viruses. It’s also effective against removing harmful gases like formaldehyde. It does this via the NanoProtect Pro S3 Filter. As mentioned at the beginning of this review, Philips has a long history producing air purifiers for consumers around the world. This video explains how the team of over 100 engineers comes together to build and test air purifiers that you can buy today. The unit comes with two filters, a pre-filter and a HEPA filter. The pre-filter is a lot like the filter you might find in your air conditioner unit. You can take it out every couple of weeks and clean it with water. The HEPA filter cannot be cleaned and needs to be replaced every few months. This is because it begins to get saturated with particles and loses its cleaning efficiency. The AC3256 will tell you when it’s time to change the filter, or you’ll notice that the air quality in the room doesn’t improve despite the unit running for an extended period of time. The HEPA filters cost around Rs 3,000 to replace, so budget for this as an on-going cost every four months that you are using the air purifier. 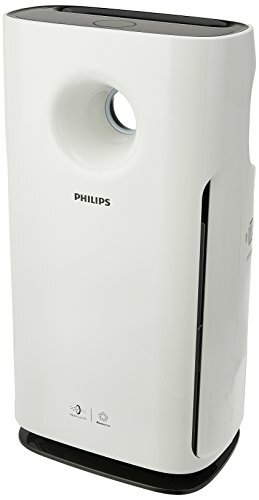 The Philips AC3256 is a good, solid air purifier for large rooms like the living room or other large rooms. It’s got a good aesthetic which means it won’t draw too much attention to itself and will sit quietly purifying the air. Thanks to the powerful fan and AeraSense technology, it is almost set and forget. Finally, if you need to move it into the bedroom in the evening, the convenient handle makes it easy to do so. At the time of this review (November 2017), the Philips AC4372 price was Rs 32,995 according to the Philips website (screenshot below). However, we found much better deals online, in particular at Amazon where it was as low as Rs 23,499. Amazon has a habit of frequently changing the prices on its website so use the widget below to check the latest price – it’s usually far cheaper than what you’ll find in the shops!